If you want a vehicle that you can easily handle, then the type of vehicle you should be on the lookout for at C.H. Urness Motor Company is the Ram ProMaster. This vehicle has been designed for carrying a lot of items and being efficient with the fuel and energy it uses. 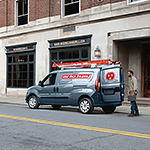 The features that make the Ram ProMaster efficient is also the type of system that makes it nimble and responsive when it comes to handling. The ProMaster has a front-wheel drive system that saves fuel with the increase of fuel efficiency. At the same time, it makes the vehicle more responsive. The responsiveness of the vehicle makes it the perfect vehicle to use through the crowded city streets. You can also maneuver the Ram ProMaster through narrow back alleys and cramped loading docks. The Ram ProMaster is available for a test drive so that you can experience and believe the vehicle.